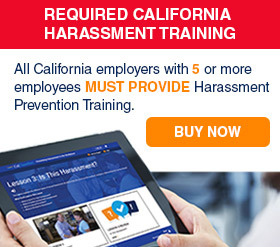 CalChamber’s laminated 27.5” x 37” English poster and 27.5” x 35.5” Spanish poster each combines the multiple pages of Wage Order 13 into one convenient poster. These posters are recyclable. Wage Order 13 regulates wages, hours and working conditions in Industries Preparing Agricultural Products for Market, on the Farm. 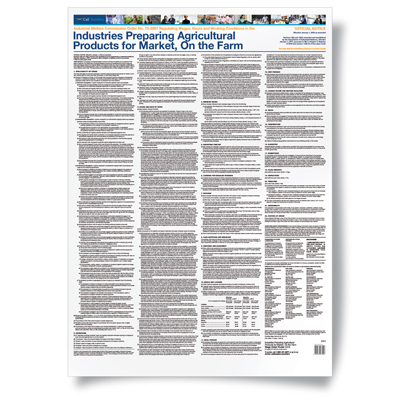 “Industries preparing agricultural products for market, on the farm” means any operation performed in a permanently fixed structure or establishment on the farm or on a moving packing plant on the farm for the purpose of preparing agricultural, horticultural, egg, poultry, meat, seafood, rabbit or dairy products for market when these operations are done on the premises owned or operated by the same employer who produced the products referred to herein, and includes all operations incidental thereto.